A Jarmazing soap pump converts a regular mouth canning jar into an elegant rustic bathroom or kitchen accessory. **Jar Not Included** Includes one soap pump with Stainless Steel Lid and Stainless Steel Jar Band - easy assembly - instructions included! 304 Stainless Steel components prevent rust and corrosion! Includes plastic tube which can be cut to size to fit pint and quart jars. Works great with liquid soap, lotion, and more. 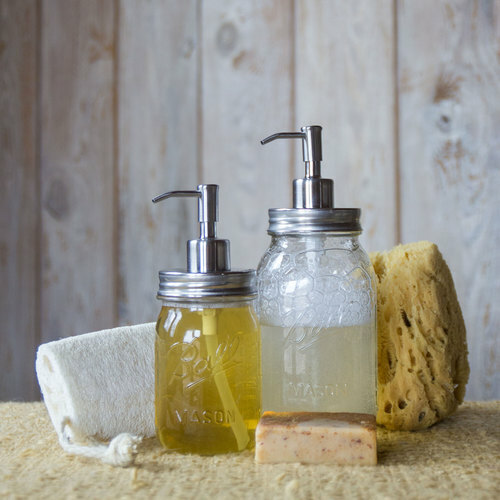 This Jarmazing soap pump converts any regular mouth (AKA small mouth) mason jar into an elegant rustic bathroom or kitchen accessory. Don't be fooled by low-quality competitor products, which are made with inferior grade metal, or lower quality stainless steel, which can rust or degrade quickly. This soap dispenser is made with a thick 304 stainless steel top and jar band by EcoJarz, which resist rust and corrosion. Sleek brushed stainless steel style adds an elegant touch to your bathroom or kitchen. Please note that a jar is not included. Recycled cardboard packaging, has a small amount of bubble wrap inside the box to protect the steel parts.